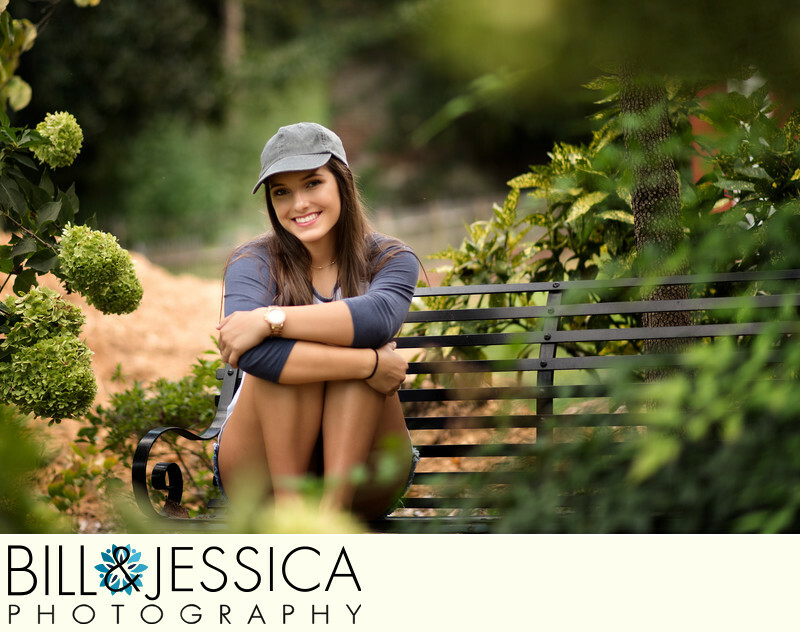 This senior photo was taken Dalton Ga, but could have just as easily been taken in Chatsworth. When we were walking around looking for various places with some interest we found this location. Again, the setup was simple and the pose natural. Imagine a group of friends exploring a local venue. It looks as if the senior girl took a break and rested on the bench for a few minutes. The hat (we love hats) gives the image a more relaxed and natural look. What also added to this image was the way we framed the subject using the plants that were available. The bench was actually on a walkway in another section of the venue. With a change in angle and framing it gives it a intimate feel. Location: 715 Chattanooga Avenue, Dalton, GA.
1/200; f/1.8; ISO 100; 85.0 mm.